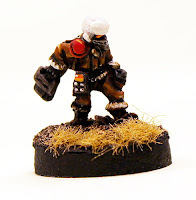 The Ion Age Blog: IMP24 PM Demolition Expert free miniature for August 2015! IMP24 PM Demolition Expert free miniature for August 2015! The sound that the Maia 12.7mm Scatter Cannon made as it loosed thousands of large rounds was like the scream of a thousand tortured voices amplified to the point of leaving human hearing. Even though the weapon was not pointed at the cowering squad its members hugged the ground in near terror as the Warlord continued to rake the lower floors of the office block across the plaza. At fourteen feet in height the giant humanoid alien held the scatter cannon like a toy and played it back and forth. Its legs and back were pock marked with impacts from Moth Rifles and its shoulder bled from where a Bodkin AP shot had actually hurt it. The squad had nothing but their Moth's and the 9mm caseless bullets simply were not strong enough to bring the brute down. They were stuck and could do nothing for the poor bastards in the building who were dying in the hail. It was then they heard the running foot steps coming up fast behind them and they turned to look seeing a single trooper at a dead run heading straight for the squad. Despite the splinters of Rubbacrete and Golglass the running trooper had sure footing and he did not even slow as he reached the prone squad and instead he simply vaulted over them and kept running. Astonished none of the members of the squad moved and just stared. In moments the running trooper covered the open ground and launched himself at the alien's back. As he did so he activated the plasma charge he was carrying in his left hand and used its magnetic clamp to lock it onto the huge shoulder armour the Warlord wore. Realising it was under attack the alien started to rotate and the scatter cannon chewed its way across the buildings around the plaza. It was too late to swat its attacker as the trooper used the underside of the giant's right elbow to flip away from the alien. Rolling and coming up perfectly the trooper came back towards the squad just as fast waving for them to hug the ground. Throwing himself down the trooper covered his head as the tiny reactor inside the charge overloaded and detonated. A pressure wave pushed them all into the ground and then the Warlord was simply gone in a cloud of expanding steam and debris. Sitting up the Demolitions Trooper removed his helmet and smiled at the stunned squad. They recognised him. Tanyo Taraman one of the best sportsmen on Carmarthen Prime and star player for the Pelcan Boosters. The Planetary Militia took all comers in times of need and these were desperate times indeed. There were more aliens to kill and Tanyo had two more charges locked onto his Aketon armour. It was going to be a day of play. Welcome to August 2015 and now we are now in the month of the release of the Year Two Collection (its online right now but our announcement will be in a couple of days to give IMP24 a chance to shine) and our twenty forth free monthly miniature! Say hello to the IMP24 Planetary Militia Demolition Expert figure its August 2015's free 15mm miniature. This miniature is automatically put into every order at the rate of one per order regardless of order value. It can also be bought in any amount on the monthly IMP page of the website for this month only too before being withdrawn on the first of next month. Got a target that just will not quit? A structure that simply will not fall down? A vehicle beating down on your lads? You need a Demolitions Expert to put the sucker down for keeps! Easily slotted into your Planetary Militia forces this miniature is dressed in standard uniform and helmet and posed in the act of throwing the charge he is carrying towards the enemy. The charge is a micro plasma reactor that overloads and delivers a detonation equal to a round from the main gun of a Taranis tank. A great miniature for your collection. This miniature is in one piece and stands approx 17mm tall. As it is the last month of our second year we look back at this time last year and see what the free miniature was at that time. In August 2015 the free miniature was IMP12 Starvaulter Advisor. 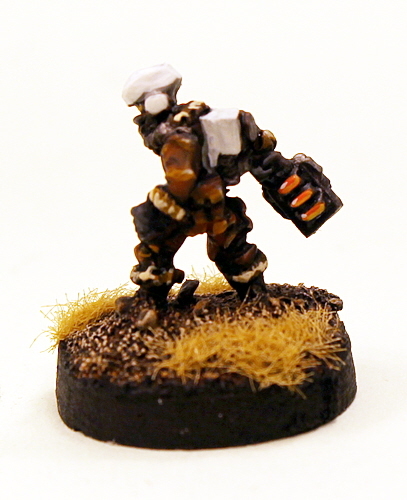 This heroic warrior with his laser rifle was our twelfth miniature to be given out free. You can find this miniature in the Year One Collection if you are lacking it. July was a cracking month and so many Vending Bots went out across the world that it is in the top three most popular IMP series figures thus far. Thank you. August will see the coolness for Patrol Angis continue with new releases and more too including articles. This begins with the Year Two Collection and then...well you all saw the first look at the 15mm Female Banneret and she is one member of a whole pack which is coming this month and you remember the first look at the SuperBlue well that is this month too! Thanks and that is a neat idea as well. Change the plasma charge for a ball and you could do it. Get painting me laddo! I'm not done my last order... I'm a man, not a machine! We are all only human but I always love to see your paint jobs once they are ready. Nice miniature, just placed an order! I ordered last month and got the Goblin campaigner instead of the Happy Burger Vending Bot, not complaining, as I didn't place an order in June. Great job as always on the free miniatures! Thanks and Thanks. Hummm...I will investigate but if you are happy then you could always catch up later now with the Year Two Collection Mark. Thank you, we do our best. Just wanted to tell you how much I loved the first Ion Age miniatures I got, which I have just finished painting. Put in an order last night for a Prydian platoon pack and am hoping to do an Ion Age platoon every second month for the next year or so: the Ion Age has given me my painting mojo back. Great job.